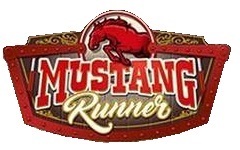 Mustang Runner has its central component placed. You will notice that the cement ring has also been completed. The piles of wood are to help support the weight of the ride arms during installation.